A varied stage with many attractions and two toll roads. Among its favourable points, walkers will pass three oak woods and have the opportunity to appreciate the green beauty of this interior Galicia. 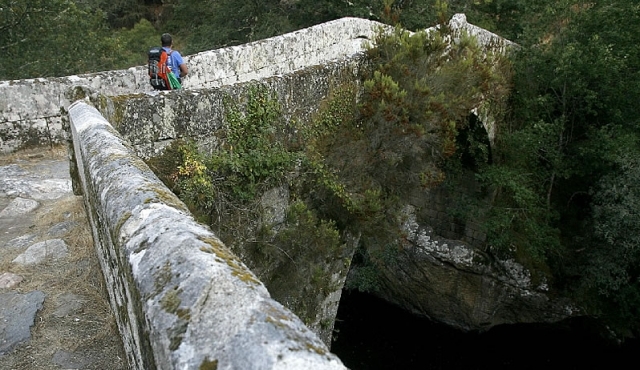 In terms of disadvantages, there is the descent prior to the albergue of A Laxe (Bendoiro), where pilgrims will find too much asphalt and, the industrial estate that they will have to border on the kilometres before reaching Silleda. On this stage travellers will pass through a number of locations, some with services, and others with examples of great heritage value, such as the notable Ponte Tabeada. Hikers have the option to divide the stage in two and make a stop in A Laxe, 7 kilometres from the end of this journey. This is the norm for those who cover the journey from Cea in just one day and stop to rest in the hostel of Bendoiro. From Pontenoufe walkers continue the hike to A Xesta and cross the PO-902 road to follow the route ahead until reaching an asphalt bridge over the railway line. The path continues on asphalt until arriving at the area of La Estación of Lalín. This area is situated 5.5 kilometres from the urban centre of Lalín. From this place there are no urban transport lines to take travellers to the centre of the town. Therefore, those wanting to spend the night here or wanting to reach the centre should do so by taxi. (The restaurant La Estación, which is later mentioned, offers a taxi service; among other phone numbers there is Taxi Lalín: (+34) 609804355- (+34) 689832325. In Lalín there are various hotels, hostels and restaurants, with prices adapted to pilgrims. The journey leads to the PO-534, via rúa Reguengo. Those in need of a rest or wanting to recuperate strength will find bars and restaurants with services for pilgrims. Continue the Way on asphalt to Doisón. Possible stop at the albergue of A Laxe Having crossed the river Cabirtas. The route continues on the N-525. Walkers will then have to choose if they want to sleep in the albergue of A Laxe or continue until reaching Silleda, almost 8 kilometres away. Those preferring to rest have to cross the N-525 and take a deviation route to the right to immediately afterwards continue to the left. If not they can continue to Vilasoa, where they will find a bar that serves breakfast from early in the day, lunch and, where it is also possible to have the credential stamped. They will later arrive in Prado, with services and, from there will continue on the N-525. 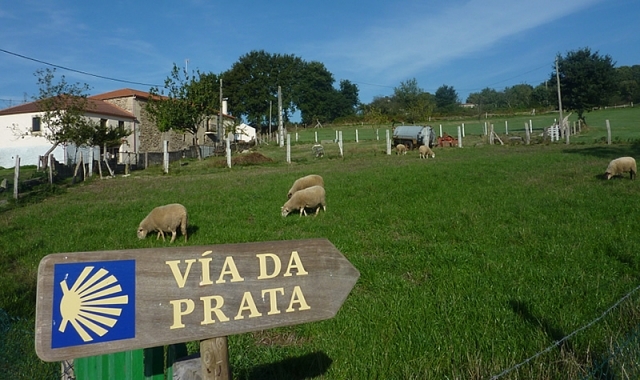 After passing through Borralla walkers arrive to Ponte Tabeada, with a rural tourist house. Hikers reach the parish church of Santiago de Taboada (XII century) and the business park Área 33 de Silleda, for those in need of assistance, the civil protection centre, where pilgrims can have the credential stamped, is situated here; (+34) 660663145 / (+34) 660664809. After reaching Carballeira de Pazo de Trasfontao, there remains just one last effort on this stage. Walkers have to cross the road and approach the first houses of this location. In general cyclists will not encounter problems, although they will face some difficulties in Ponte Taboada, due to the conservation of its original road, with large stone slabs of different sizes and, after passing through the village of Trasfontao where the road often resembles a river of mud. On both sections cyclists will have to dismount. En el Albergue Turístico de Peregrinos, que nos sirvió un excelente caldo gallego. Hay supermercados en la calle, para abastecer. Tuvimos una noche descansada como merecimos. Después de caminar horas, fue en el café restaurante Estacion en Botos, que con inmensa simpatía y bien servir, nos dieron la primera comida del día (el desayuno), relleno y harto. ¡Gracias! He encontrado este paso con mucha carretera. Salimos temprano de Castro Dozon y no encontramos ningún café abierto en las aldeas por donde pasamos, hasta Botos. Después de caminar horas, fue en el café restaurante Estacion en Botos, que con inmensa simpatía y bien servir, nos dieron la primera comida del día (el desayuno), relleno y harto. ¡Gracias! En Laxe ninguno de los peregrinos vio el albergue y continuamos la ruta siguiendo las señales. Llegar hasta Silleda fue difícil. En el Albergue Turístico de Peregrinos, que nos sirvió un excelente caldo gallego. Hay supermercados en la calle, para abastecer. Tuvimos una noche descansada como merecimos. 1 reviews Distance to Santiago: 64 km.